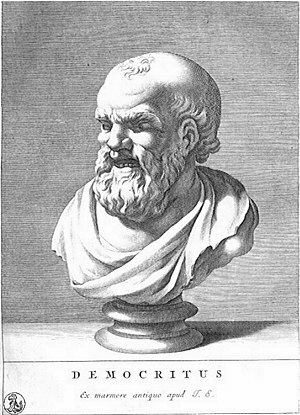 In the West, the references to atoms emerged in first half of 5th century BC from Leucippus, whose student, Democritus, systematized his views. In approximately 450 BCE, Democritus coined the term átomos (Greek: ἄτομος), which means “uncuttable” or “the smallest indivisible particle of matter”. Although the Indian and Greek concepts of the atom were based purely on philosophy, modern science has retained the name coined by Democritus. However, Aristotle and Theophrastus explicitly credit Leucippus with the invention of Atomism. Nevertheless, the basic idea of the atom was adopted by scientists thousands of years later because it elegantly explained new discoveries in the field of chemistry. Chemistry is the science of chemical bonds between atoms. Physics has two parts: the science of mechanical movement, called classical physics (this is what Newton, Galileo, Archimedes etc. all studied); and the science of energy, atoms and particles. Chemistry could easily be considered a subset of physics. Well, chemistry is using physics in the same way as physics is using math. And math is close enough to philosophy, so, fare away from practical use, we are close to contradict The Bible. Remember scientific method, observe something, emit hypothesis, design and conduct experiment, communicate the results, on short, subject here is you. Or me. When the experiment don’t give the expected results for physician the device is wrong, for chemist still exist regression analysis and curiosity to practical use of the results as they are. In another words, chemistry is close to engineering. Physical chemistry is the study of macroscopic, atomic, subatomic, and particulate phenomena in chemical systems in terms of physical laws and concepts; often using the principles, practices and concepts of physics like motion, energy, force, time,thermodynamics, quantum chemistry, statistical mechanics and dynamics. Physical chemistry, in contrast to chemical physics, is predominantly (but not always) a macroscopic or supra-molecular science, as the majority of the principles on which physical chemistry was founded are concepts related to the bulk rather than on molecular/atomic structure alone; for example, chemical equilibrium, colloids, etc. So I’ve arrive at Chemical physics a subdiscipline of chemistry and physics that investigates physicochemical phenomena using techniques from atomic and molecular physics and condensed matter physics; it is the branch of physics that studies chemical processes from the point of view of physics. What if the question sounds like teacher or pupil ? « Value and scarcity, what is going on if the society is rich.